This is a sponsored post written by me on behalf of Insightly. As much as I loved unplugging from technology while on vacation, the 500+ emails I came back to were overwhelming. I’m still wondering if I let any important messages slip through the cracks. As a busy entrepreneur, I’ve come to realize that relying on notes in iCal and flagging emails in my ever-growing inbox is not the best strategy. I work with nonprofits, entrepreneurs, small and large businesses. I write for them, conduct presentations and workshops for them, and I coach them. There is a lot of email. There is a lot of calendar scheduling. There is a lot of planning. Oh, and I blog too. How could I forget about that? What it all comes down to is that there is a lot to keep track of, and I’m only one person. While I do have a wonderful virtual assistant, she is not in my office every morning bringing me coffee and organizing my day. (If only I could afford that kind of personal assistant!) I still need to be organized to ask for help. I work with a few different project management systems on jobs on which I collaborate with other people. They are helpful when you have multiple team members working on the same project, particularly if they are not all in the same location or the same company. I’ve looked into using these systems for my own projects and customer relationship management (CRM). The problem is that there is usually a cost associated with these programs, and I have yet to justify the cost. Plus, I had trouble finding a program that could do everything I needed all at once. And then I found Insightly. 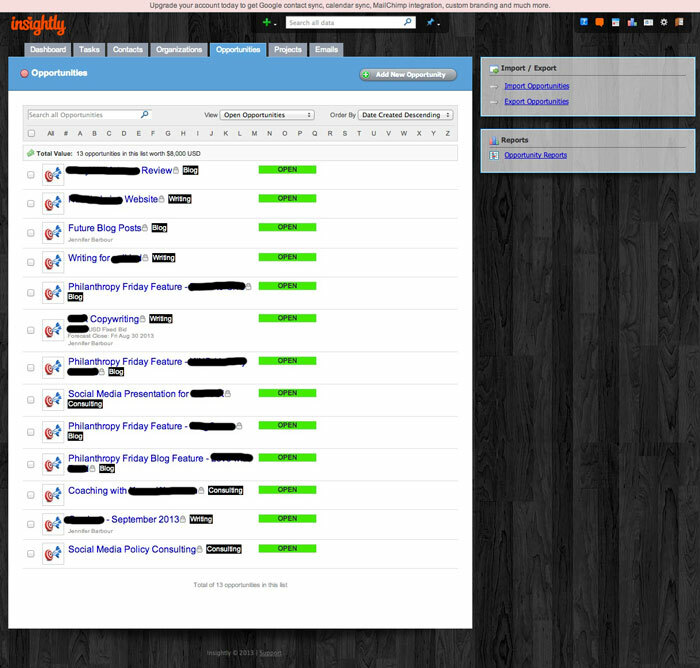 Insightly is a web-based CRM system with a ton of options for busy entrepreneurs like me. I’ve been using the free version for a week, and I’m already feeling more organized. What I really like about Insightly is that you can fully integrate your emails with the program. When you sign up for an account, you get a specific email to use when you want to include the correspondence in your Insightly dashboard. So, when you email a contact and copy the email to your Insightly address, it appears in your Emails tab. From there, you can create an Opportunity, Project or Task. In addition, Insightly will automatically add the contact to your Contacts list and save any files that were attached to the email. It will even search for that contact’s social media profiles! I immediately started to organize my emails and contacts into Opportunities. As you can see from the screenshot below, I was pretty busy last week! (I blacked out my clients and partners’ names as many of these projects are pending.) I further categorized my Opportunities according to the work each job would entail. I made categories for Writing, Consulting and the Blog. Once I created my Opportunities, they were assigned specific email addresses. When I had further correspondence with my contacts from each Opportunity, I could forward messages to the specific address for that Opportunity and see everything in one place. I had phone conversations and made notes in a few of my Opportunities. In others, I created events for meetings and tasks (with reminders) so that I would remember to follow up or write a post by a certain date. I added files, including a proposed agreement and artwork for a post. There’s at least one Opportunity that I will (hopefully) turn into a Project soon and invite other collaborators to participate in the Project. I’m barely scratching the surface of what Insightly can do in this post. Honestly, I keep finding new things I can do with it each day I use it. To find out what it can do for you, I strongly suggest signing up for a free account. For most of us, it’s all you need to keep yourself organized, sane and on top of your contacts and projects. While I was compensated to review Insightly, the opinions and words are all mine. oh oh oh I need this!!!! I am going to check it out! I just realized that I can totally use Insightly to organize my thoughts, notes and writing for my book. Another way to use Insightly! My mind is spinning at all the ways I can use it. Now I just need some free time to sit down and enter everything in, which I will be doing soon since the school year has now started. Thanks for the mention too! Seriously, Michelle, I keep finding new uses for it! I just started forwarding emails over to it and creating Opportunities. It’s worked well. So happy to have found it. And you’re welcome for the mention. Your post inspired me to dig into it. It had been on my to-do list when I first read yours! I’ve tried a few different CRM programs, but haven’t been too happy with any of them. I haven’t written any of them off just yet, but I definitely am curious about Insightly. I’m usually the kind of person who gives something a shot once and if it takes me forever to figure it out, I drop it! Ha. But, this looks good, thanks for sharing! Oh…and this is my first time to your blog! And, yes, I’m yet another Jennifer! Hi Jennifer! I’m glad you found me. I forgot to mention that there are some great videos to help you figure out all the features of Insightly. I found them helpful, and I’m very impatient! Michelle first showed me the magic of Insightly and I feel like there is so much there! I keep organized in my own haphazard way. It works for now but won’t if I want to expand. Tamara recently posted..We Had The More Much Fun. It’s that expanding piece that always gets me. I’ve needed something like Insightly for a while. It’s been great so far. It’s pretty user friendly. More so than others I’ve tried for sure. I love that I can see everything in one place and not have to fish for past email messages and/or notes! This does look cool- I am going to have to try to check it out soon! Awesome, Leah. Let me know what you think! anotherjennifer recently posted..Celebrating International Left Handers’ Day with All Things Left-Handed! Hmm…. veeeeery interesting. Hmm… perhaps I need to look at this. Maybe it will make me feel like a professional. Or at least stop my head from spinning every time I sit at my computer!! Like Michelle, I need some free time to dig into it. I’ll pin this and hopefully get aroundtoitthis weekend. Thanks for sharing. I’ve been pondering ways to get my email organized. It’s been so helpful, Joi. I forward the important emails to my Insightly account and organized everything from there. Love it! My pleasure, Kathrine! I really like that I can use it to manage emails, contacts, tasks and projects all at once. How horrible is it that it’s 2013 and I’m still a paper kind of gal? I’M EVEN FROM THIS NEW TECHNOLOGY GENERATION. But I have paper files, paper agenda, paper calendar, paper EVERYTHING. It’s the only way I can maintain my organizational sanity. I can’t rely on paper. I’d lose the paper or I wouldn’t be able to read my writing! But, whatever works, right? this is such a great resource, thanks for sharing babe and linking up. I have been getting it set uup = hope it will be easy to use to organize the process for my books! Thank you for sharing it with us on Pin IT Tuesday! Happy to have something to share! I need to set up a project for my book writing. I think it will be super helpful and make me feel like I’ve done something! I love Insightly!! Use it everyday! It’s a great tool, Danielle. And you can’t beat free! Do you know if you can use Insightly to bill clients? Not with the free version, but there may be an option in the paid version. I use Wave Accounting for invoicing. It’s free and a nice way to keep track of finances.